Taco Soup is quick and easy, easy to double/triple for a crowd, freezer friendly and only takes 30 minutes to make! You haven’t had Taco coup until you try this CHEESY, creamy Taco Soup version! This 30 minute, ONE POT Taco Soup recipe is the ultimate comforting, hearty soup packed with all your favorite taco flavors. It’s made with ground beef, beans, corn, tomatoes, peppers, onions and homemade taco seasoning simmered in a rich enchilada-beef broth. Top your Taco Soup with tortilla chips, cheddar cheese, sour cream, and avocados and you have a new Taco Tuesday favorite in soup form! This Taco Soup is a dump-and-simmer dinner perfect for weeknight dinners or its easy to double or triple for crowds. Say hello to a new family favorite! 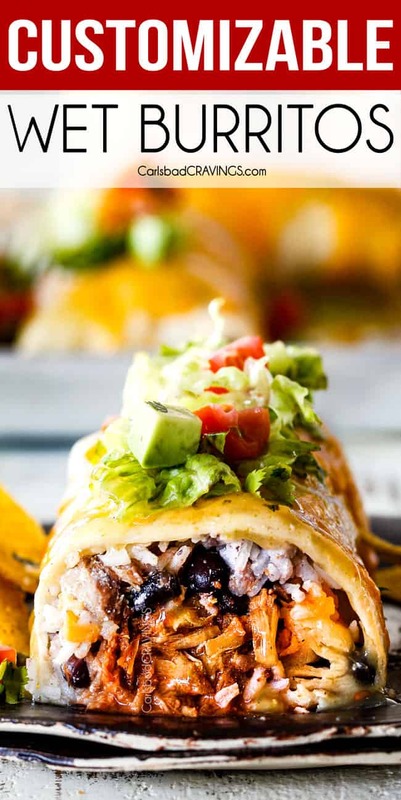 I love tacos in every form from my from Taco Spaghetti to Taco Pasta Bake and I LOVE Mexican soups from Chicken Fajita Soup and White Chicken Chili so when you combine two loves you get the BEST EVER TACO SOUP! The first time I tried Taco Soup was as a young teenager at my sisters home. My married sister loved to cook and experiment and the “7 Can Taco Soup” was wildly popular at the time. As I spooned the frito topped soup into my mouth, I was enthralled at the idea of eating taco soup! Since then, Taco Soup has continued to be a favorite of mine (and probably the rest of the world), but my Cheesy Taco Soup version is my ultimate favorite. My Cheesy Taco Soup recipe is based off of my Cheesy Chili Dip. The first time I made this dip, I instantly knew I would make it into Taco Soup so we could all shovel it into our mouths even quicker than a dip and call it dinner. And what an easy, dinner it is. It is also a wonderful make ahead meal that you can refrigerate and reheat or keep on the stovetop on low or even add to your slow cooker on the warm setting. The majority of ingredients in Taco Soup are either pantry staple cans or spices you dump into the soup so you can make this meal-in-one Taco Soup any night of the week! Ground Beef: take care you use lean ground beef or see substitutions below. Onion: You can substitute the onion with 1 teaspoon onion powder. Garlic Cloves: You can substitute the garlic with 1 1/2 teaspoons onion powder. Homemade Taco Seasoning: We create homemade taco seasoning with chili powder, ground cumin, dried oregano, smoked paprika, salt and pepper. This custom blend adds the perfect punch of flavor. You may substitute with 1 pouch (2 tbsp) taco seasoning and then adjust seasonings to taste. Canned Mild Diced Green Chilies: Make sure you purchase mild green chiles – I have accidentally used the hot chilies before and they are HOT! Mild green chiles, however are more tangy than hot so you don’t have to worry about them making your soup spicy. 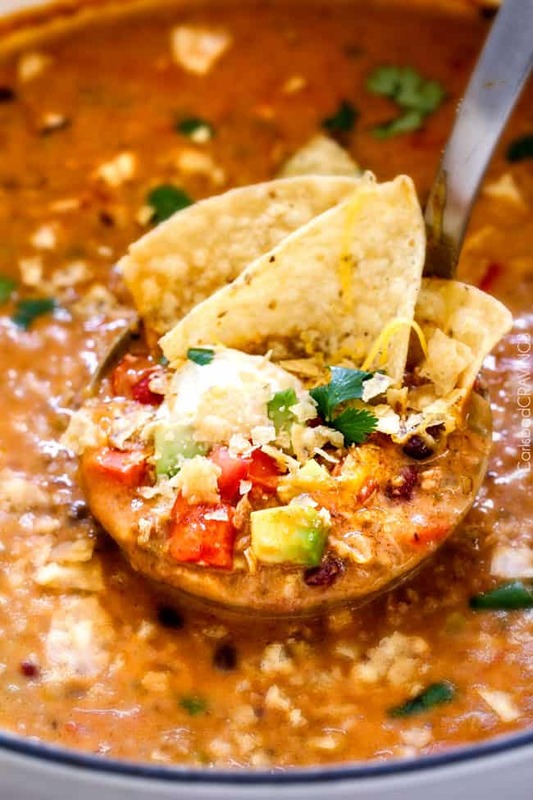 Salsa: This Taco Soup recipes uses your favorite salsa instead of just diced tomatoes to give your soup another dimension of flavor. Make sure you us mild salsa or else your Taco Soup might be too spicy. It is easy to add more heat but it is hard to take it away! Canned Black Beans: You can substitute with pinto beans, kidney beans, cannellini bean or your favorite bean. Canned kidney beans: I like pairing both kidney beans and black beans together for added texture but you may substitute with additional black beans. Canned Sweet Corn: I use canned corn for this Chicken Tortilla Soup for convenience but feel free to use corn fresh off the cob if you prefer. You can also use frozen corn but add it toward the end of cooking, just so it has time to warm through, otherwise it can disintegrate. Mild Enchilada Sauce: Feel free to use your favorite homemade enchilada sauce if you prefer. Chicken Broth: Take care your chicken broth is low sodium so you can salt to taste. Cream Cheese: cream cheese makes the soup wonderfully creamy. You may use 1/3 fat cream cheese but it will not melt quite as well. 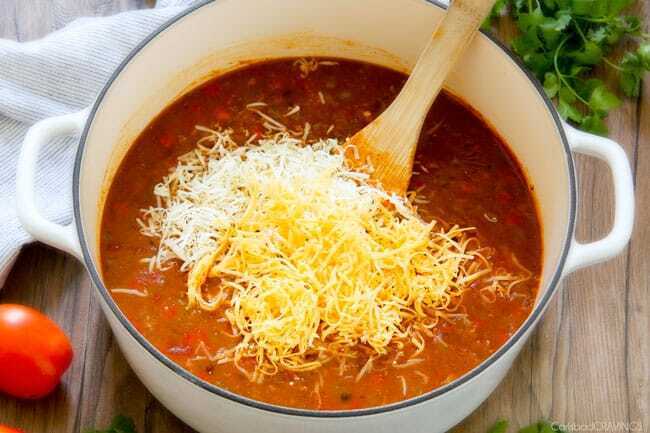 Cheese: We add sharp cheddar cheese and pepper Jack to make our CHEESY Taco Soup. Take care you use freshly grated cheeses so they melt easily. You can omit the cheeses and add cheese to individual servings if you prefer. Absolutely! You can make Taco Soup with ground turkey or ground chicken. Whenever I make these beef substitutions, I add 2 teaspoons beef bouillon and then add salt to taste (because bouillon is already salty). 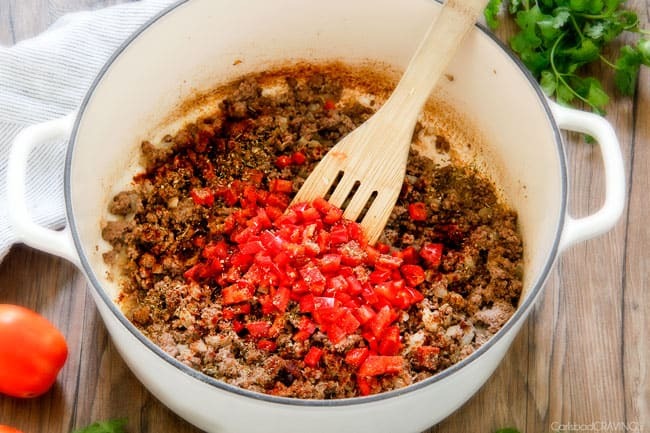 I use this trick in my Turkey Chili and Turkey Tacos and it is magic! It imparts a beefy flavor without the beef! 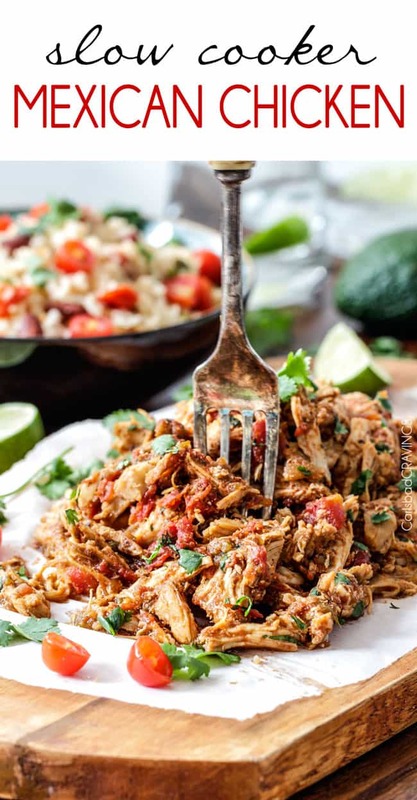 You can also make Taco Soup with chicken by either using shredded rotisserie chicken or simmering the soup with chicken breasts or thighs until they are pull-apart-tender like I do in my Chicken Tortilla Soup. Do you put tomato sauce in taco soup? Instead of tomato sauce, I use enchilada sauce in this Taco Soup recipe because it has more flavor than tomato sauce and doesn’t leave the broth tasting like your slurping tomato sauce. 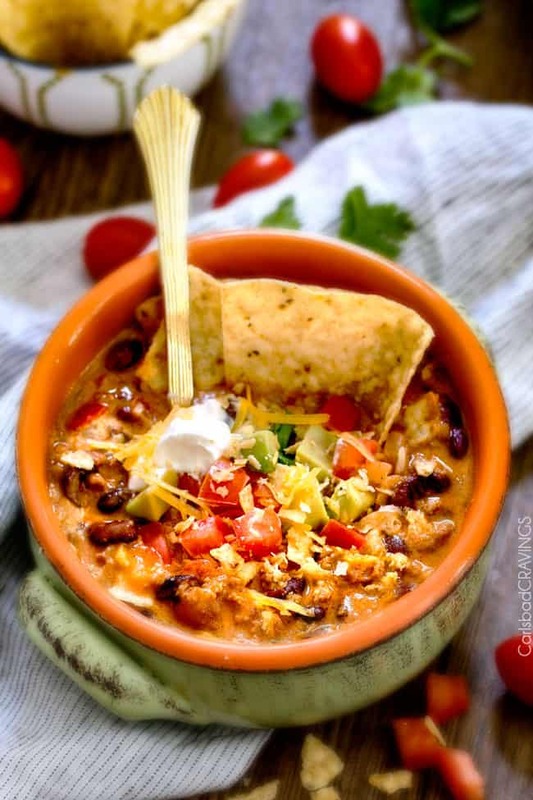 If you are looking to make this Taco Soup gluten free, then substitute the enchilada sauce with tomato sauce (or use gluten free enchilada sauce) and add additional seasonings to taste. You will also need to omit the flour or use gluten free flour. Step 1: The almost dump and run soup begins by browning your beef with onions, then adding your spices, garlic, bell peppers and sprinkling with flour to help it thicken and creamify. Step 3: Melt in some cream cheese then stir in half cheddar and half pepper Jack cheese for creamy, Cheesy Taco Soup! What to serve with Taco Soup? Tortilla chips: tortilla Strips are the Taco Shell in Taco Soup! We also love to use fritos. Cheese: we’ve already made our our Taco soup creamy and cheesy but that doesn’t mean it can’t benefit from a little more cheese! Use freshly grated cheese for superior taste and melting ability. Sour cream: a must in my book! Sour cream adds a wonderful creaminess and its refreshing tanginess cuts through and compliments the robust, rich flavors. You can also use fat free sour cream or Greek yogurt. Cilantro: chopped cilantro adds a fresh, zesty flair. Avocado: chopped or sliced avocados add a wonderful creaminess. I prefer chopped so I can get a bite of avocado in every spoonful. Pico de gallo: a spoonful of pico de gallo ins’t necessary but adds a depth of freshness I love. You can also use chopped fresh tomatoes. Sliced jalapenos: a fabulous topping for those who want to add some heat. Lettuce: We even add shredded lettuce to our Taco Soup! It reminds me of adding cabbage to soup and adds a fabulous texture. This Taco Soup is easy to make in your slow cooker or crock pot for a walk-in-the-door eat right away dinner. Spray slow cooker with nonstick cooking spray and add chicken. Follow step 1 in which you brown the beef with onions, add spices/seasonings, red bell pepper and garlic and cook with flour for 3 minutes. Transfer beef mixture to slow cooker followed by all remaining Taco Soup ingredients up to the cheeses. Add very soft cream cheese and stir/whisk until melted, followed by pepper jack and cheddar cheese until melted. Add milk to thin to desired consistency if desired. Season with additional salt/pepper/hot sauce to taste. 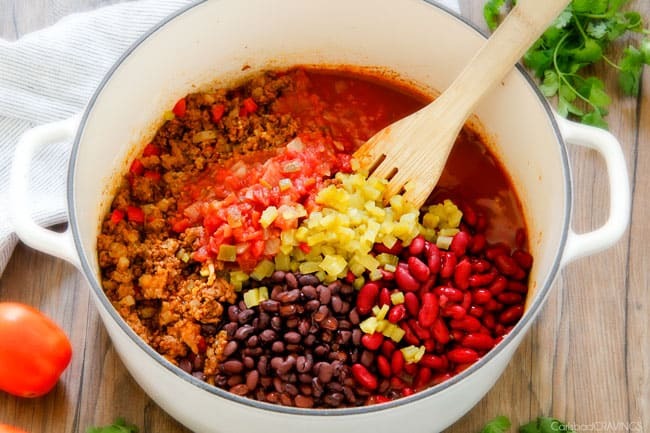 HOW SPICY IS THIS TACO SOUP RECIPE? This Taco Soup has a ton of flavor but is not spicy. That being said, the spice level can change depending on how spicy your salsa is. You can spice up the Taco Soup by adding hot sauce to individual servings if you like it spicier. HOW DO YOU MAKE CREAMY TACO SOUP? melt 4 oz. softened cream cheese at the end of cooking and stirring until completely melted. This is the method I also use i n my Mexican Chicken Corn Chowder and it is fabulous. melt pepper Jack cheese and sharp cheddar cheese directly in the Taco Soup. if you are out of cream cheese, you can substitute 2 cups of the chicken broth with heavy cream or half and half mixed with 1 tablespoon cornstarch. you can also add sour cream directly to the soup for a creamy tangingess. HOW LONG DOES TACO SOUP LAST? Taco Soup tastes even better the next day! It will last in the refrigerator for up to 5 days in an airtight container. You may need to add a little water to the soup when reheating. CAN I FREEZE TACO SOUP? I do not recommend freezing Taco Soup with the cream cheese and cheeses because the fat in the cheeses will separate and create a funny texture. You can freeze your Taco Soup without the cream cheese and shredded cheeses. HOW DO I FREEZE TACO SOUP? Add Taco Soup to a freezer size bag or airtight freezer safe container. When ready to eat, let Taco Soup thaw in the refrigerator. 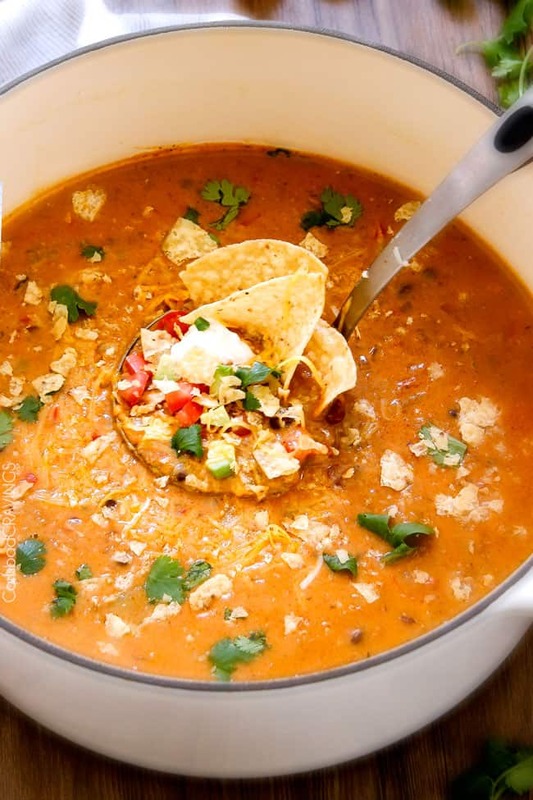 Want to try this Best Taco Soup? Pin it to your Soup, Mexican, or Dinner Board to SAVE for later! 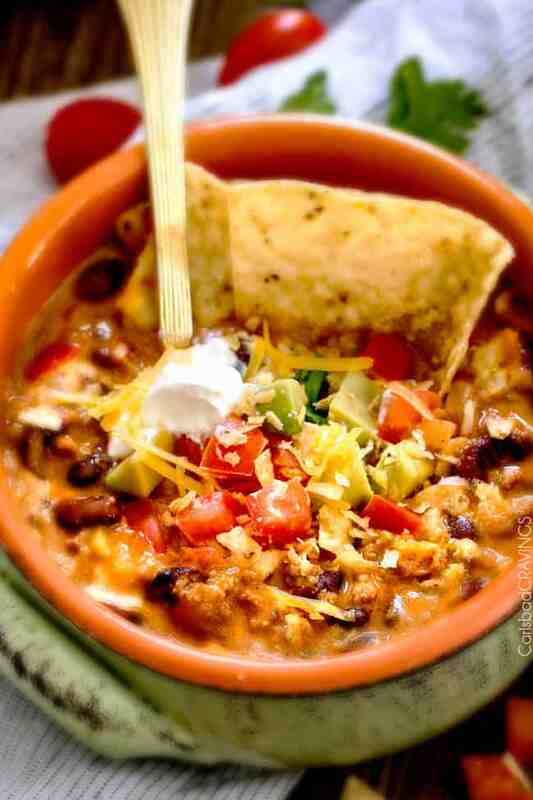 You haven’t had taco soup until you try this CHEESY Taco Soup version! This 30 minute, ONE POT Cheesy Taco Soup recipe is the ultimate comforting soup packed with all your favorite taco flavors and is SO easy and great for crowds! Say hello to a new family favorite! Heat 1 tablespoon olive oil over medium heat in a Dutch oven or soup pot. Brown the meat with onions until meat is cooked. Add all spices/seasonings, red bell pepper and garlic. Sprinkle in flour and cook, stirring constantly for 3 minutes. Stir in kidney beans, black beans, green chilies, salsa, enchilada sauce and chicken broth. Bring to boil then reduce to a gentle simmer, stirring occasionally, for 10-15 minutes or until slightly thickened. Turn heat to low and stir in cream cheese until melted, followed by pepper jack and cheddar cheese until melted. Add milk to thin to desired consistency if desired. Season with additional salt/pepper/hot sauce to taste. Serve with tortilla chips/fritos and additional garnishes as desired. *If you like spicy, then heat it up with some medium salsa! I use medium Kirkland brand salsa from Costco. **Once prepared, you can keep soup warm in your slow cooker until ready to serve if desired. I made this a few days ago, but I wanted to let you know how much my husband and I are enjoying this soup! I love the creaminess. The flavor of the soup is so good! You really do a great job mixing all those herbs and spices together. The only thing I did differently was make a homemade enchilada sauce, but other than that, I followed the recipe. This is very delicious and definitely one we’ll remake. Thanks so much for sharing your recipes! I appreciate what you do. Thank you so much for taking the time to make my day! I’m so happy you both are loving this soup and I’m sure your homemade enchilada sauce made it that much more delicious! Made this soup tonight and it was a hit. The kids loved it and even the husband went back fur 2nds. I will be adding this to my list of recipes! yesssss! I’m so happy it was a hit with everyone, thanks so much Jequila! The typed recipe is missing the corn…. I don’t have corn in my recipe but you are welcome to add it! I made this a couple days ago for a do-ahead dinner, leaving out the cheeses and cream cheese until adding when I reheated it last night. Some good comfort food here when served with all the toppings, we all loved it! I make the cheater chili cheese dip with canned chili, mexican cheese blend and cream cheese in the micro so will have to try yours from scratch. Hi Stephanie, what a delicious idea for a make-ahead dinner! I’m so happy everyone loved it! Your cheater chili dip also sounds delish – I’m interested to see how they compare! I’ve made this about 8 times for my boyfriend. He has a hard time choosing his favorite requests for me to make, but he raves that this is easily in his all-time favorite 3. It turns out perfect every time! I’ve even tried it with ground turkey instead of beef, and other reduced-fat versions of the ingredients, and it still tastes the exact same – a totally scrumptious flavor bomb! Kudos to such an infallible, customizable recipe! Thank you so much for your awesome comment Iris! I’m thrilled it is such a customizable favorite!